In this tutorial, you will learn how to create a simple mixed reality application. Select 3D mode and click Create project. 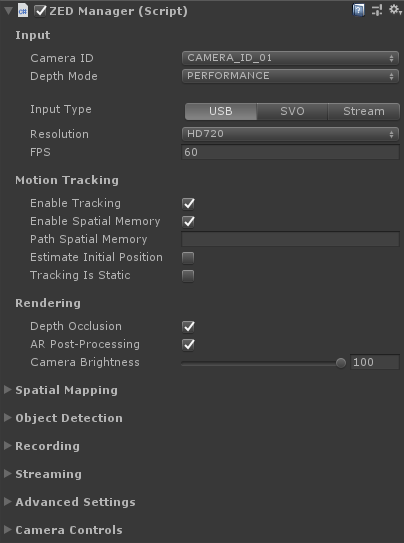 Make sure the ZED SDK is installed, and import ZEDCamera.unitypackage. After importing the package, set the aspect ratio of your Game Window to 16:9 with a scale of 1x . If the aspect ratio and scale is anything else, the image will appear distorted or blurry in the main window. Here we will add the ZED Rig prefab to the scene to replace Unity’s conventional camera. The ZED Rig appears at (0,0,0) with -Z representing the forward direction facing the camera. In the Hierarchy panel, delete the Main Camera. In the Project panel, navigate to Asset > ZED > Prefabs. Drag the ZED_Rig_Mono.prefab into the Hierarchy. Click on ZED_Rig_Mono in the Hierarchy to display the attached ZED Manager script in the Inspector panel.